It's one of the most sought after suits of armor in the Fallout universe, and now it can be yours. Sure, it's a little small to wear so you won't be suiting up and jumping into the wasteland anytime soon, but it's a fun reminder that once your workday is done you get to go home and dive into the immersive world of Fallout 4 and have an awesome night of exploring and adventuring in the Commonwealth. This POP! 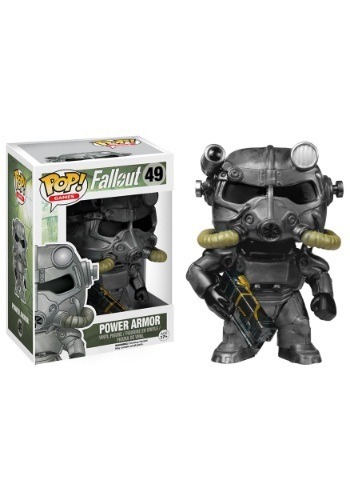 Fallout Brotherhood of Steel Power Armor Vinyl Figure is must have for any Fallout fan... just be sure to thank West-Tek (and Funko) for all their hard work in bringing us this collectible. Llegó en perfectas condiciones, tardó unos 20 días en llegar mis manos en Buenos Aires, Argentina. Teniendo en cuenta las demoras que suele tener la aduana local, bastante bien.